The “worst” of Africa was now behind me. 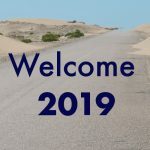 The current political news about South Africa, the most European country on the continent, weren’t very positive but it was considered a good holiday destination. But how about cycling? According to South Africans it was way too dangerous. Let’s see. I left Namibia in a sandstorm. A nice driver took me across the bridge to Alexander Bay and dropped me in front of the police station. There wasn’t much else. He thought, I could pitch my tent there. Here the weather was just as stormy. Rather than camping, the nice policemen offered me a whole house. Normally this is a refuge for traumatized women but I didn’t quite fit that category. Apparently, everyone else was well and I had the house to myself. Fantastic! All the sand washed off my body under the shower, there was a shower, and electricity. What a welcome to South Africa. Next day there was no sign of the storm. 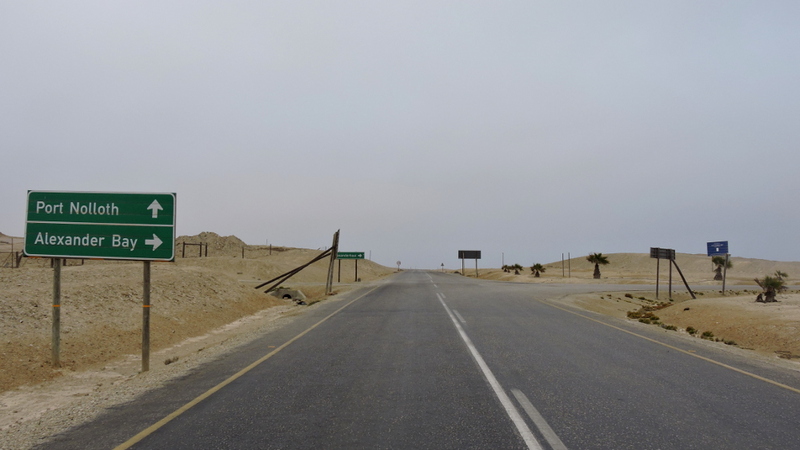 The next town was Port Nolloth and it was very odd. I got the impression that half the population was either drunk or handicapped. I quickly left for the mountains. There were fences everywhere. Was there a need to fence in nothing? In the beginning I couldn’t understand. On the South African side there was also a diamond exclusion zone. But afterwards? I was told it was grazing land and perhaps one couldn’t see the animals. 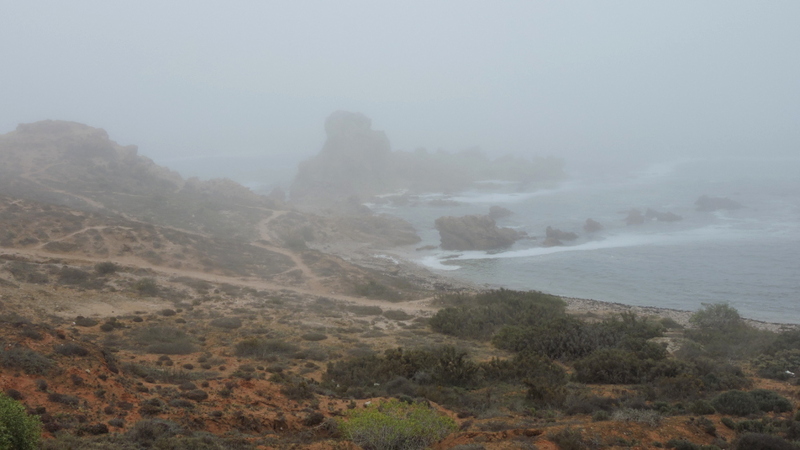 Other than in Namibia, there were no animals in sight: no zebras, springbok, etc. I came to the next village, Steinkopf. Again, everything was fenced in, at least once. 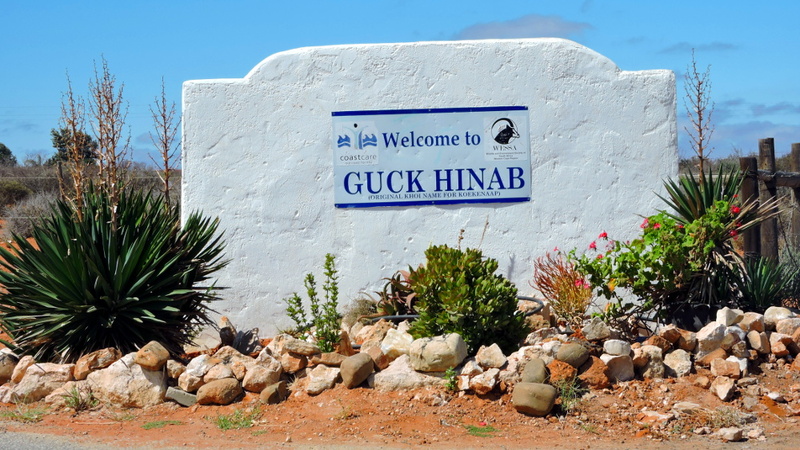 Was the aim to protect the locals, mainly black, from the outside or was it the other way around? I learnt very quickly that everything in South Africa was fenced and very often there was a wall as well. Sometimes topped with barbed wire and with a sign “armed response”. It was quite a challenge for stealth camping! Nevertheless, I always found a place to sleep. Early on, I enjoyed the good pavement and the beautiful landscape. But the rolling uphills with headwinds were exhausting. Towns were few and far between and often not inviting. 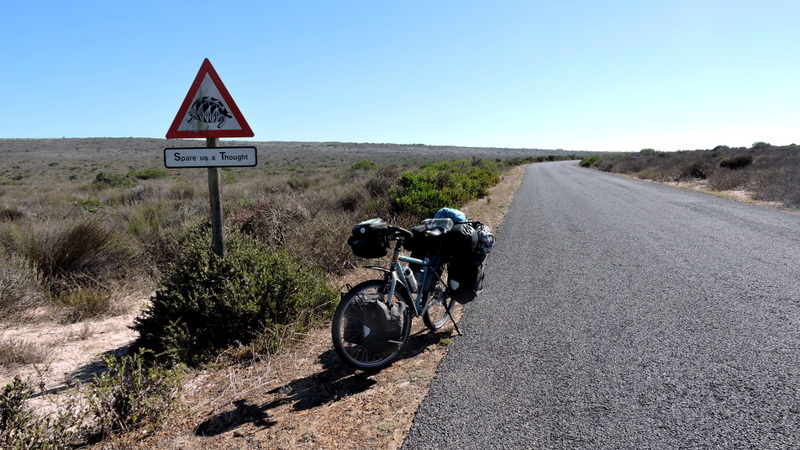 In the town of Nuwerus I turned onto gravel and towards the coast. How much I now enjoyed the gravel! 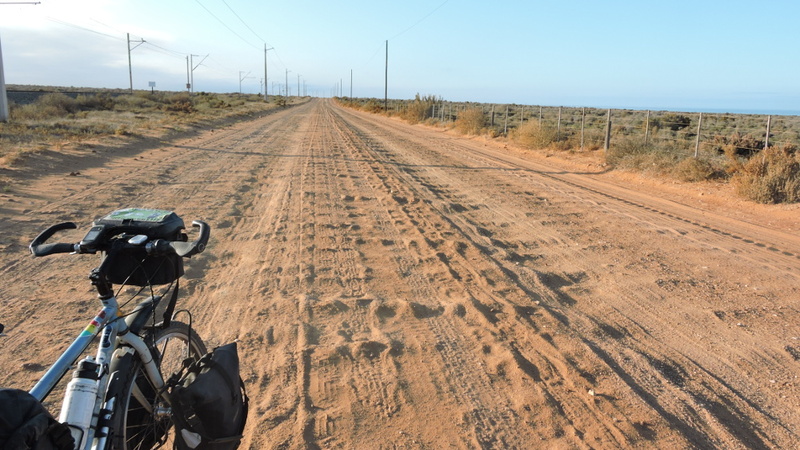 This time I knew it would be weeks but only half a day until I reached the next paved road. Every once in a while, I asked myself, was I still in Africa? The raging waves and cold wind from the Atlantic didn’t invite to go for a swim but they were a nice diversion. There was a train track that ran along the coast. I doubt that the trains transport diamonds, more likely coal. The good thing about the railroad was this adjacent road which was closed to passing traffic. This was a bad stretch but there were still a few cars. Of course, there were also fences but not where there were underpasses. Those were great places to camp: completely quiet and sheltered from the wind. There was a train in the evening, at night, and in the morning. They were pretty long and it took about three minutes for them to pass. Really, coals and not diamonds. I was taking a break when the ostrich appeared. It seemed very tame and when I continued, it ran alongside me. 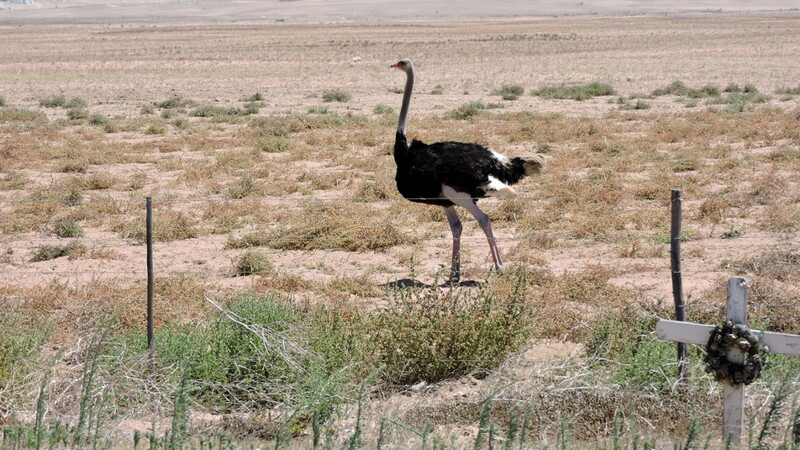 My surprise about the animal was taken care of when I discovered that this was the first ostrich farm which I passed. There would be many more. When I came to towns, I was sometimes asked for money. These three boys asked for bread and I didn’t turn them away. Each got a roll which they devoured. In return, I was allowed to take a photo of their amazing bikes. Only the frame remained but one could fix wheels from shopping carts and one never got a flat. Pretty smart! As I got closer to Cape Town, traffic increased. 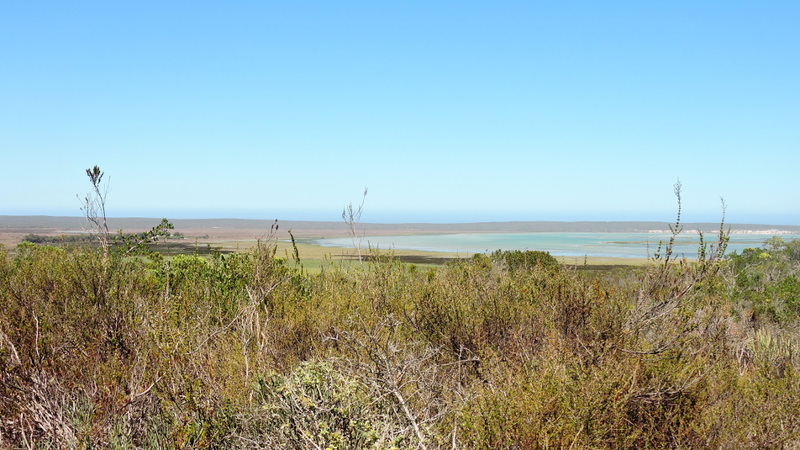 For a diversion, I cycled through the West Coast National Park. It was a delight to cycle on these small roads without any traffic. 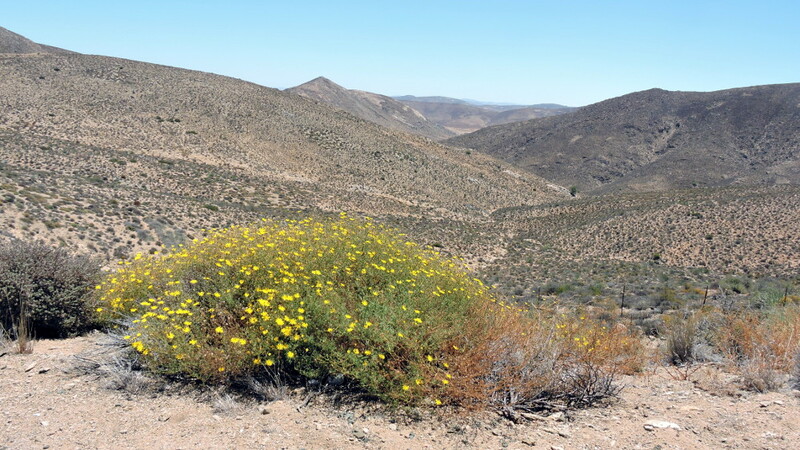 Apparently, it was a different story when the wildflowers bloomed. I enjoyed the tranquility and the turquoise waters of the bay. 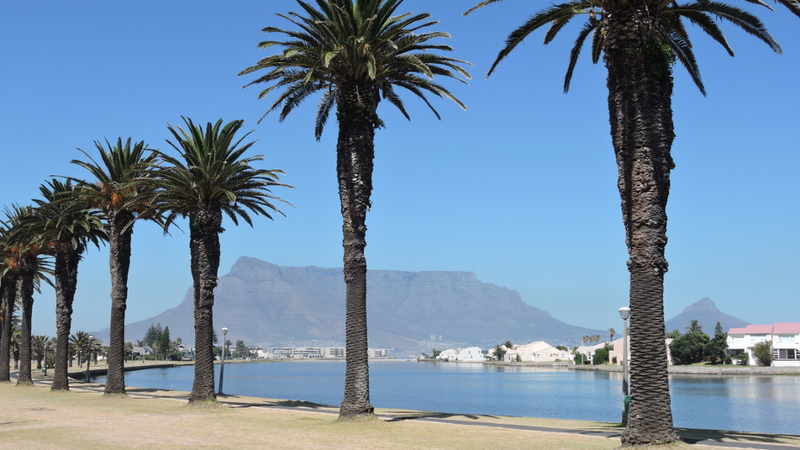 Table Mountain appeared from far away. 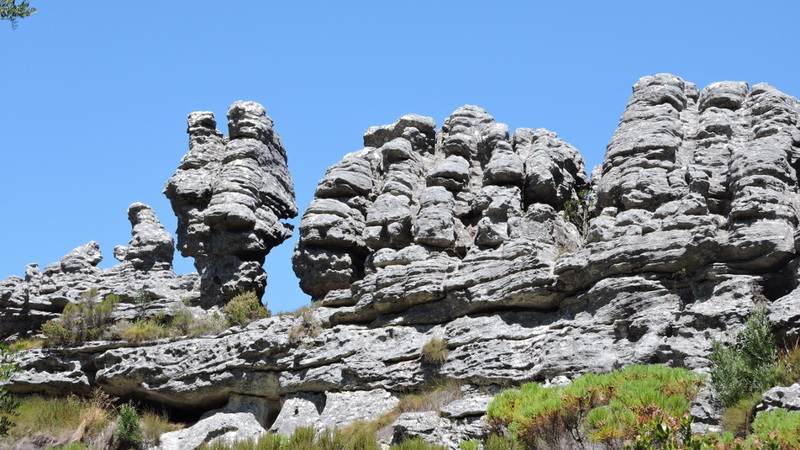 But I wasn’t sure if it really was Table Mountain because from my vantage point it looked different than on the photos which I had seen. 16 kilometers from downtown, I was surprised to find a bike path. 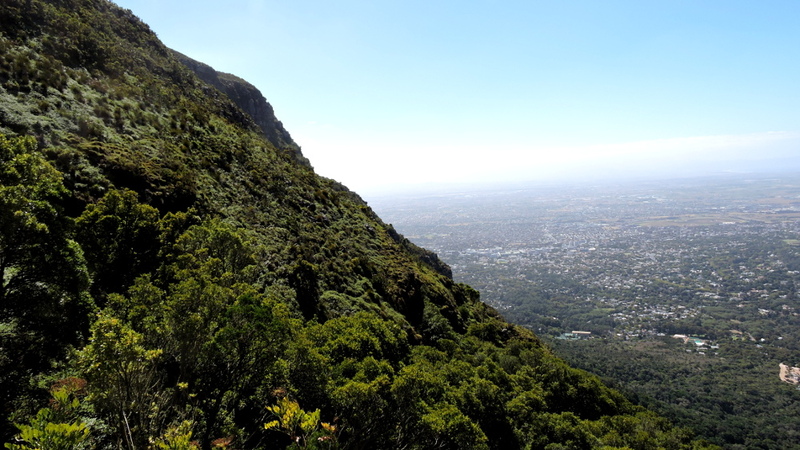 The starting point was “Table View” and I assumed I had been right about Table Mountain. 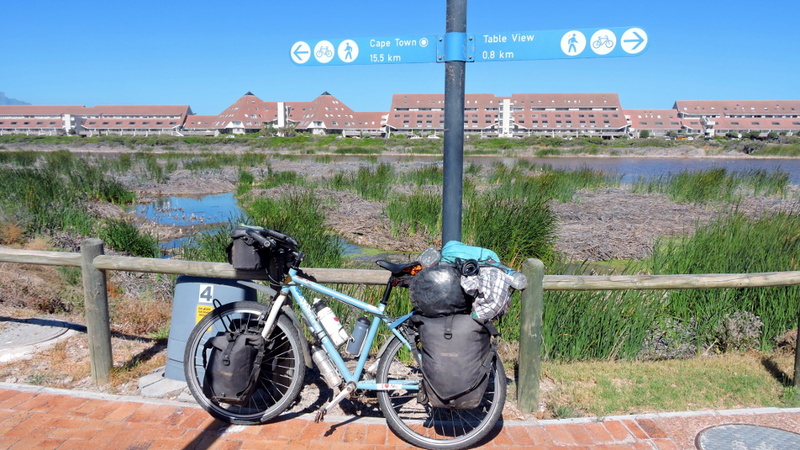 Sadly, the bike path ended suddenly at the train station in Cape Town. Thanks to another cyclist, I found the way to the other side of the tracks. Then my GPS took over. I had the chance and honor to stay with the Philips Family. 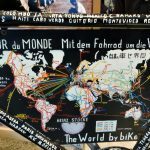 In 2015/2016 they biked through southern Africa and all were avid cyclists. If you’re interested in their adventure and other tails, check out unclippedadventure. The family has by no means retired and is up for activity each day before work. 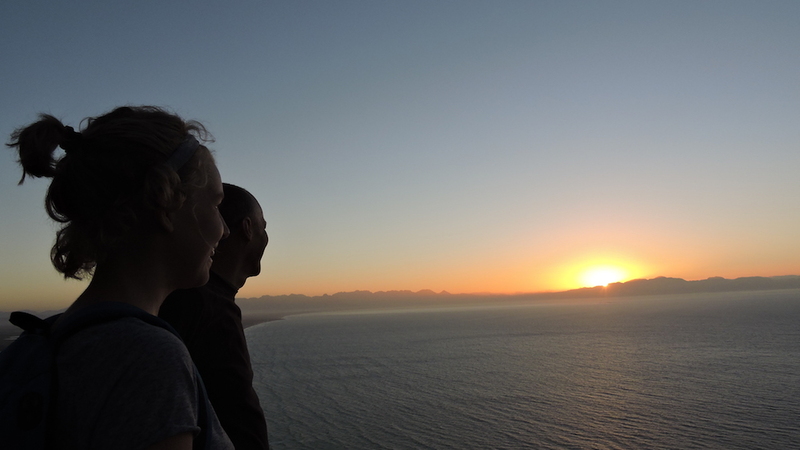 Thus, I had the pleasure to enjoy the sunrise from one of the mountains in Cape Town. Together with Stewart, the dad, and Tegan, the daughter. Afterwards I was ready for the day. There are many opportunities for longer day tours. Tegan suggested I cross the mountain to the other side of the peninsula. 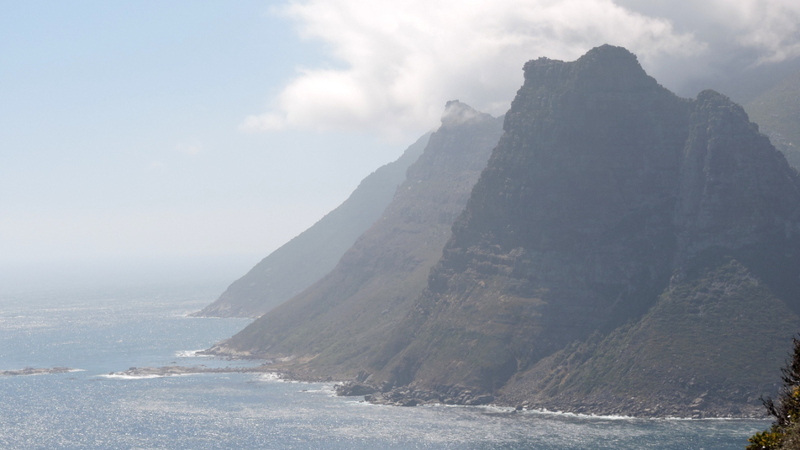 And then cycled Chapman’s Peak Drive to the city. There was no doubt that these were amongst the most scenic coastal routes in the world. For many people this was the most beautiful city in the world. Cyclists, or rather their bikes, are also looked after. But it wasn’t that easy. Crime was on the rise and the discrepancy between rich and poor was growing. It didn’t look much like an African city. 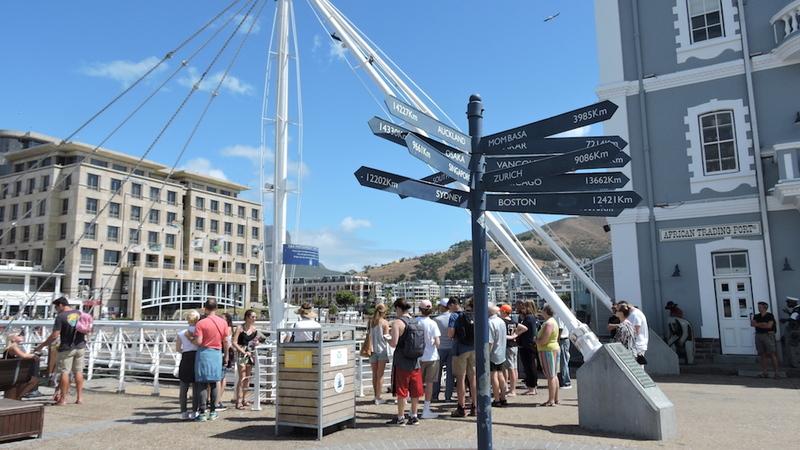 Cape Town could be in Australia or in America. 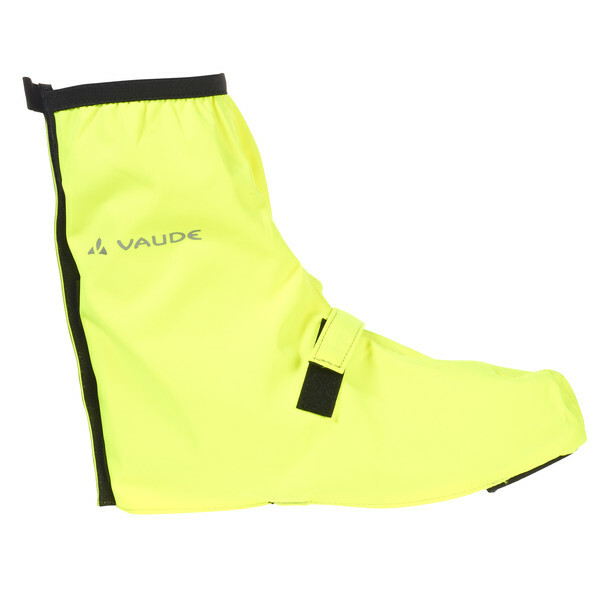 I cycled about 200 kilometers in the city and fortunately nothing happened to me. 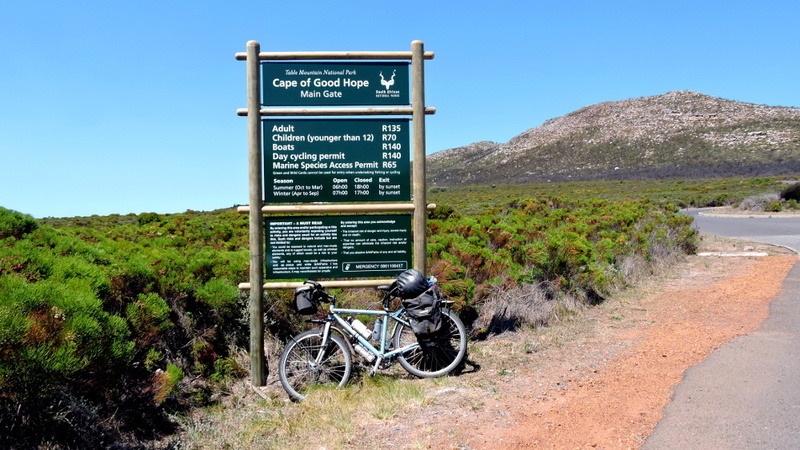 I wanted to enjoy Cape Point and the Cape of Good Hope to the fullest and took two days to explore them. 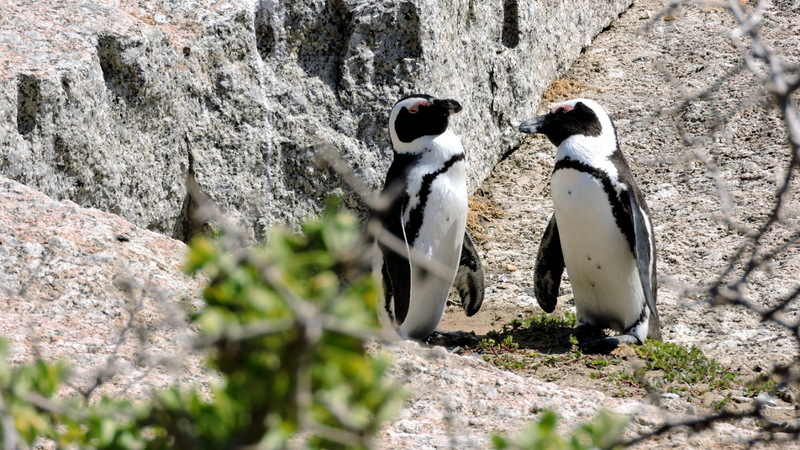 To the penguin colony in Simonstown. 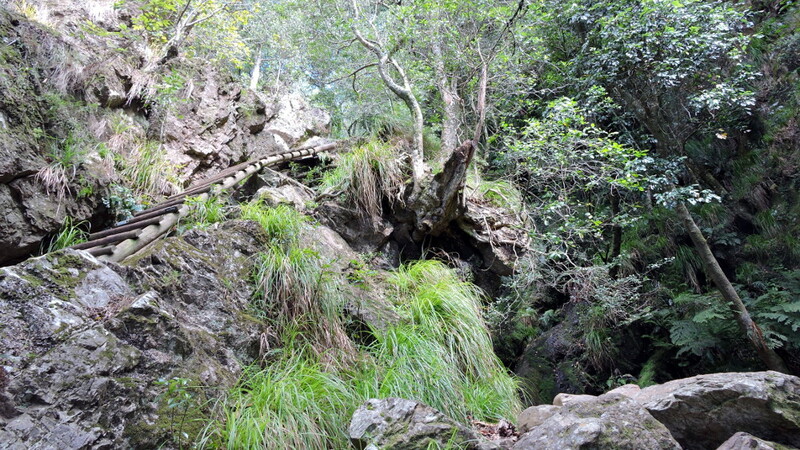 Along the coast, up and down through thick bush, I went to the national park. This is the only national park which is more expensive for cyclists than for cars. I asked the woman at the gate for the reason but she didn’t know. A manager explained to me that “cycling is an activity and therefore it’s more expensive”. I had a hard time not to laugh. You might not believe it but drivers sometimes parked their cars and went for a hike on the trails. But they didn’t need to pay for that. 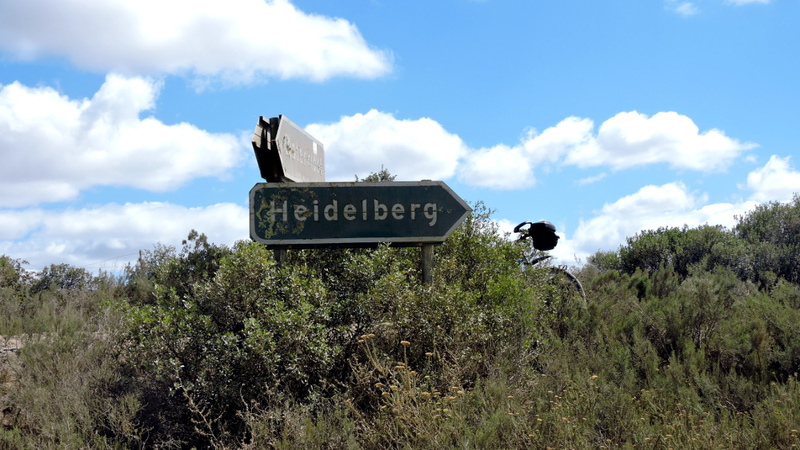 I assumed that there would be nice bike trails as I had experienced them in the West Coast National Park. But I had no luck. It was incredibly windy and I understood why there had been so many shipwrecks. 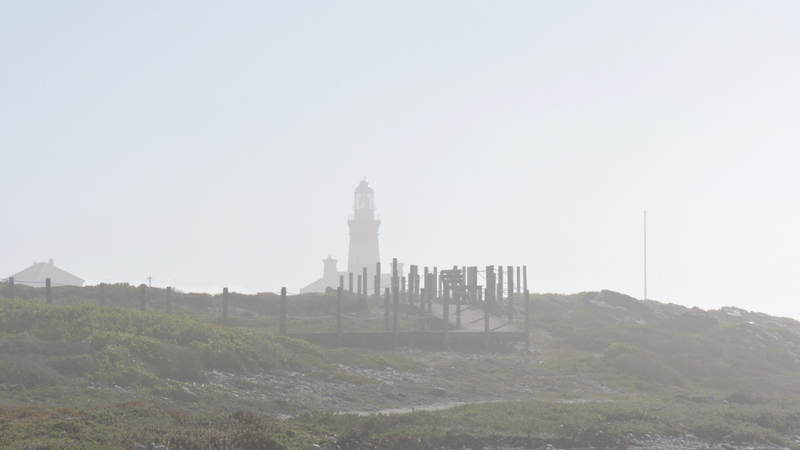 Even so it was stormy, the park was full of tourists, even at the lighthouse of Cape Point. 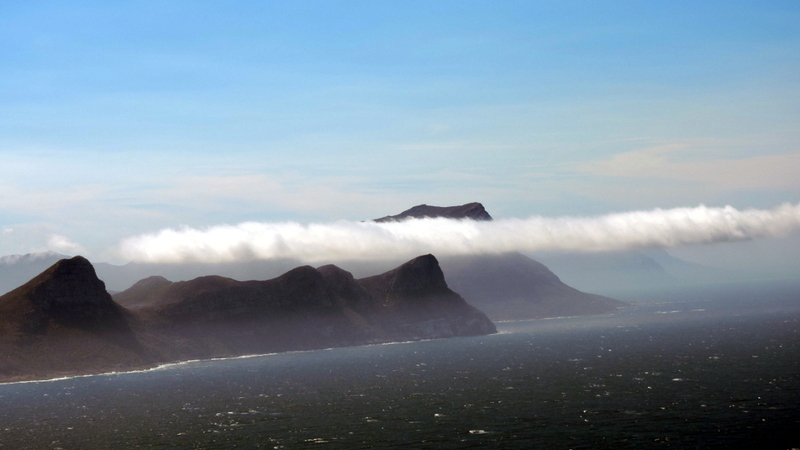 Cape of Good Hope from the top. 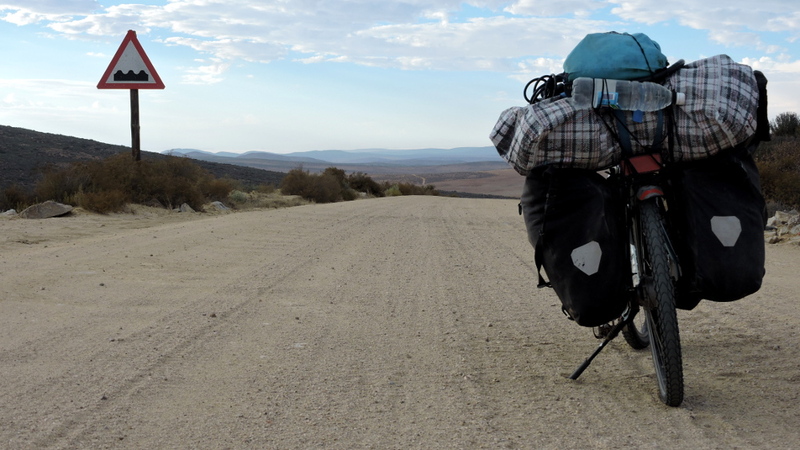 I cycled back on the west side of the peninsula where I found a quiet spot to camp. 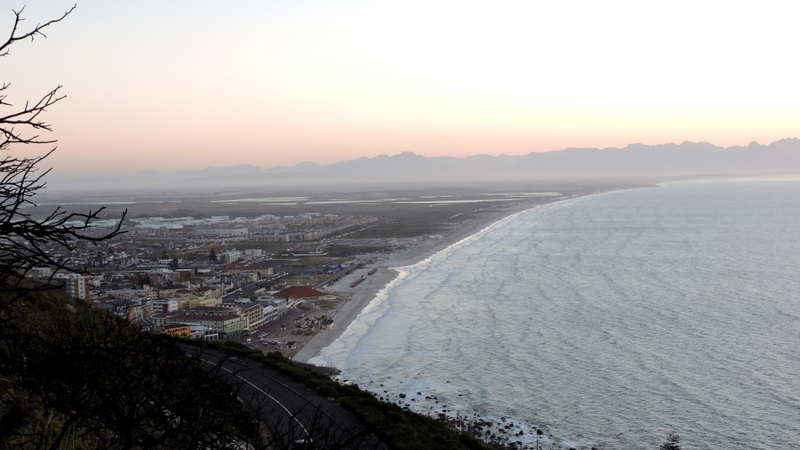 Then I returned to Muizenberg. 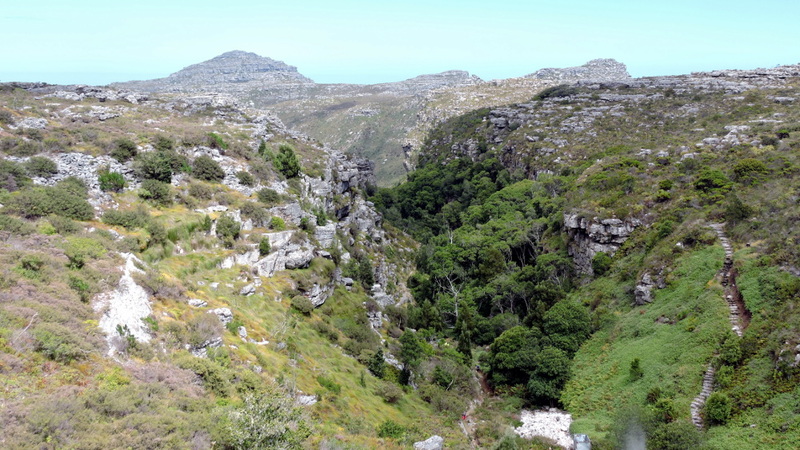 Before I left the city, I had to conquer Table Mountain and my hosts recommended the trail up Skeleton Gorge. I’m not so much into hiking. Why walk when I could take a bike? But when one climbs over rocks and couldn’t cycle, it was a lot of fun. It was fantastic. I was almost embarrassed how hard it was for me. I’m just not used to mountain climbing. An old man walked ahead of me and his boots looked even older than he was. He had an even and relaxed pace. “You look as if you don’t do this for the first time”. He beamed “No, already many times”. I wished him good luck and many more hikes. 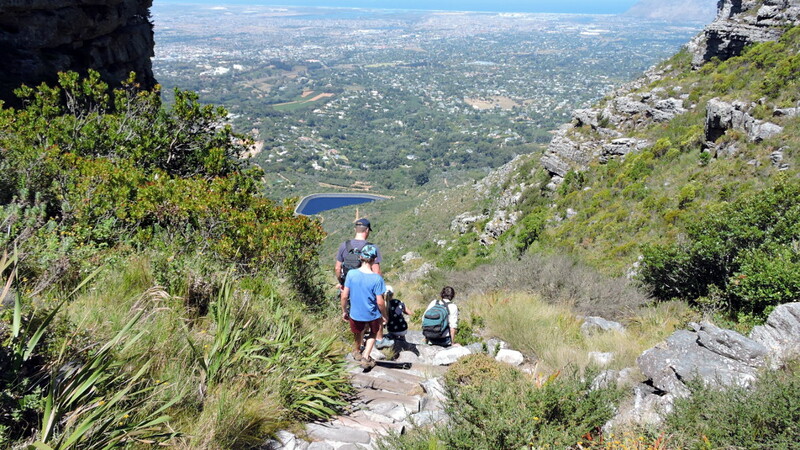 And then I was at the top and admired Cape Town. My knees were happy when I reached the bottom. 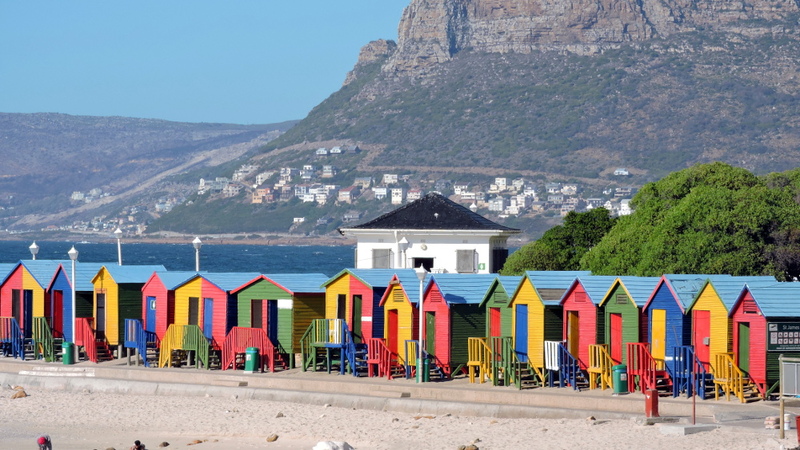 Cape Town has absolutely incredible opportunities for leisure time. Few cities can compete. Now it was time for me to continue and I had taxed the hospitality of the Philips Family enough. 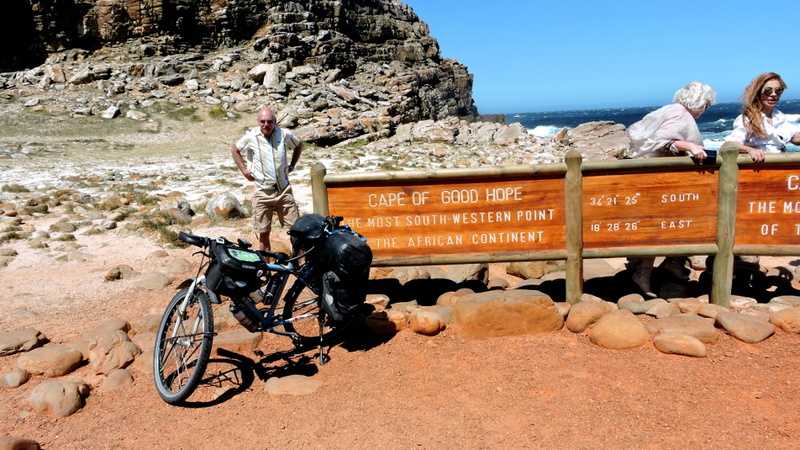 I was circumnavigating Africa and therefore I had to visit the southern-most point of the continent. 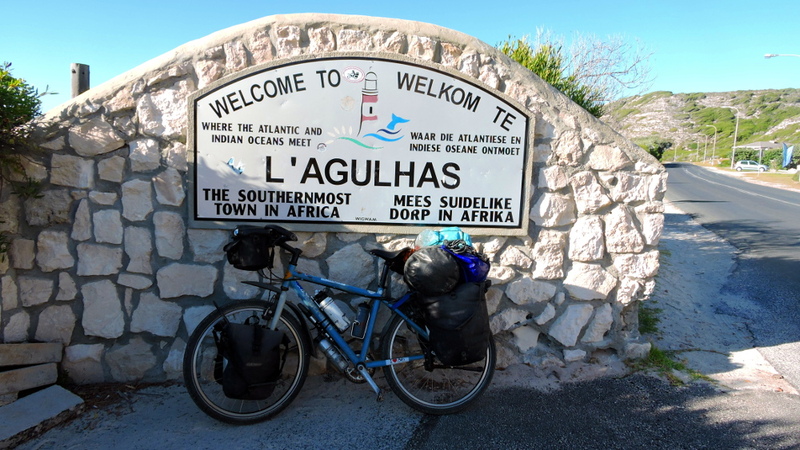 It wasn’t the Cape of Good Hope but Cape L’Agulhas. 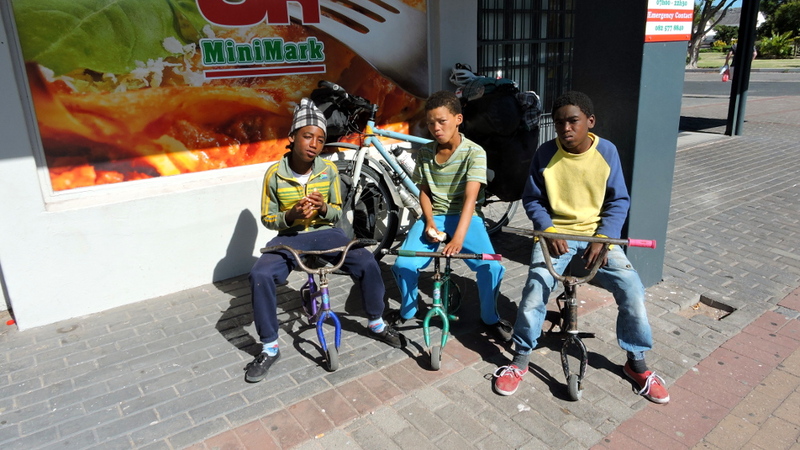 In order to leave Cape Town, I had to cycle through the township of Mitchell’s Plain. The tensions between blacks, coloreds, and whites were very tangible and it wasn’t a nice place. Probably not very safe and a policeman who was out on patrol, escorted me. I had wanted to stop in the next town to get something to drink. No white people in sight. 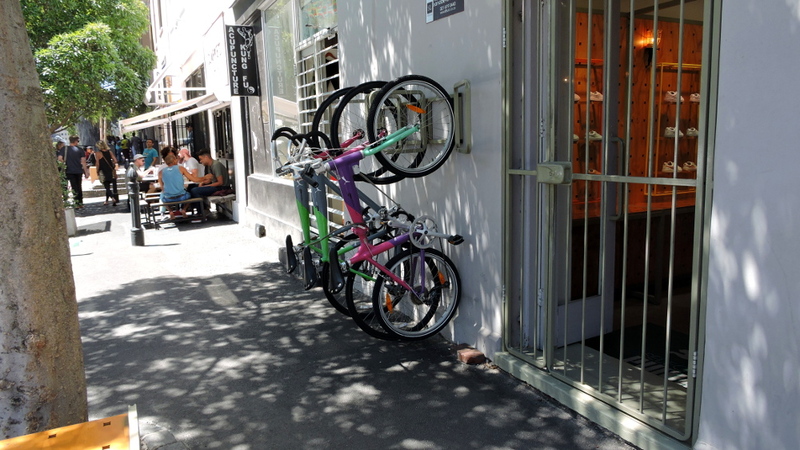 As if it was the normal thing to do, I cycled to the center and locked my bike right in front of the shop. I could see it from inside but when I came back out, the bike computer had been stolen. I had forgotten to take it with me. Fortunately, I had the GPS with me. It could have been worse and after a while I even enjoyed riding without the computer. 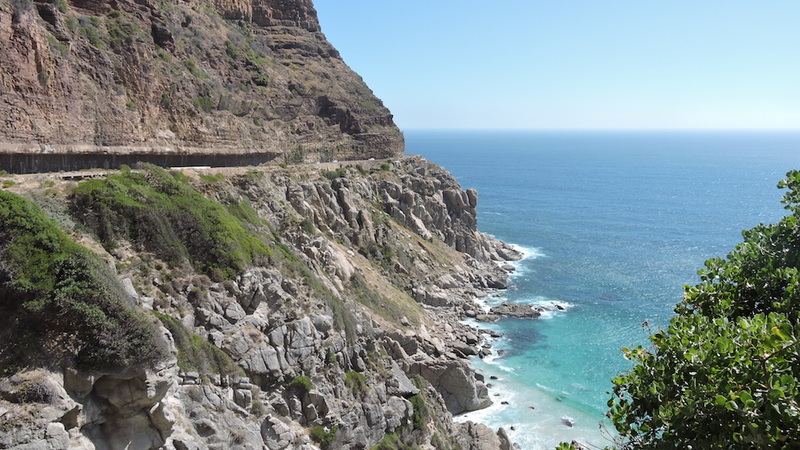 And then I was back on one of South Africa’s stunning coastal roads. 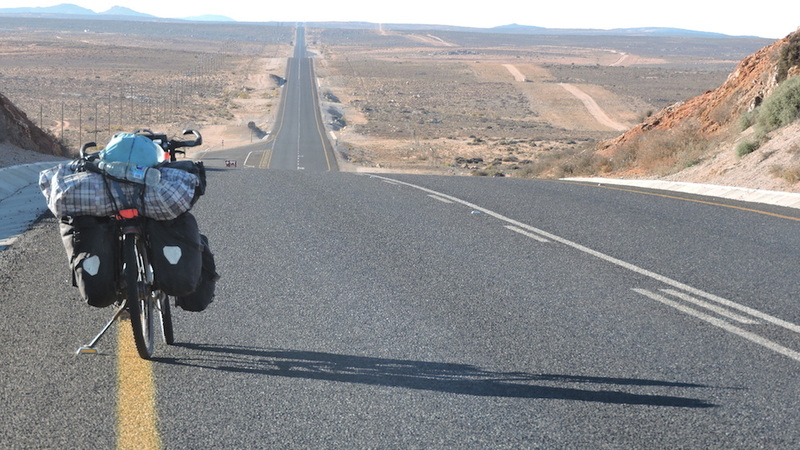 A few days later would be the big bike race “Argus” in Cape Town. For that event, the South Africans offloaded their bikes from the cars. 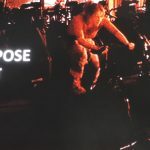 35,000 cyclists were registered and everyone who cycled here, trained for the event. The track was 100 kilometers around the peninsula. (This year for the first time in its 40-year history, it had to be canceled due to strong winds). 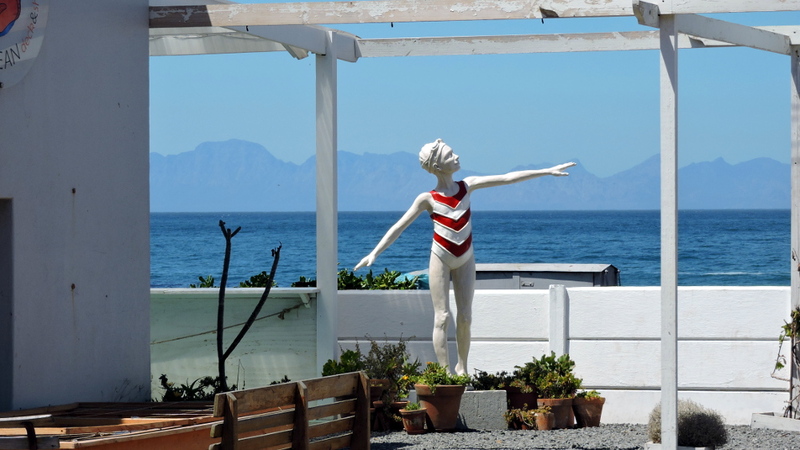 Hermanus was another European city, the Adriatic of South Africa. Auberge Burgundy is virtually its center and there were numerous tourists in the sidewalk cafés. 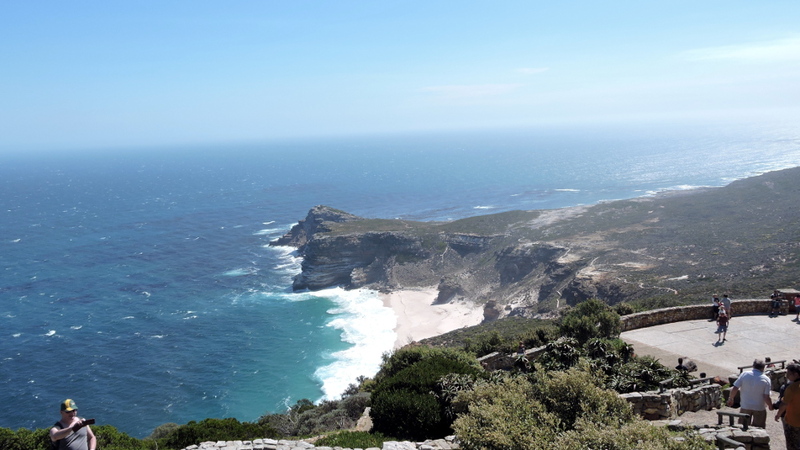 This was where the oceans split: on the west side was the Atlantic and, on the east, the Indian Ocean. From now on it’d be more pleasant for swimming. I shopped for the essentials at a nearby shopping center and ate. An elderly woman approached me and said, I looked tired. She invited me to stay at her guesthouse, wrote down the address, and said her twin sister was there. It was only 11 am. 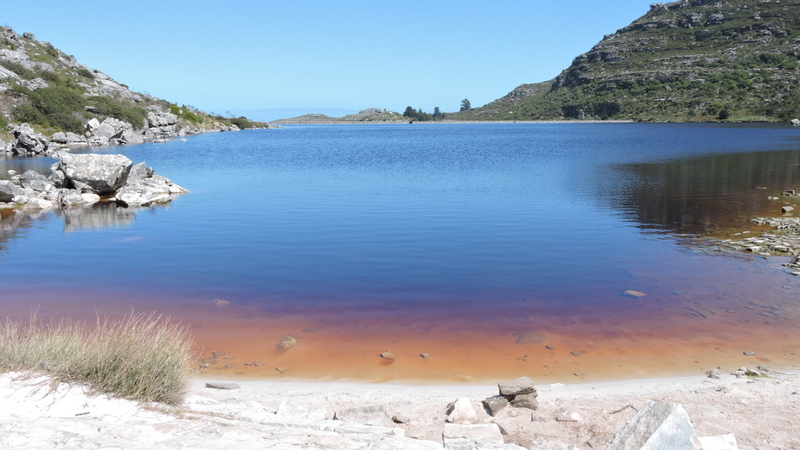 I could enjoy the whole day at the cape and go for a swim. Great! After that I went inland. 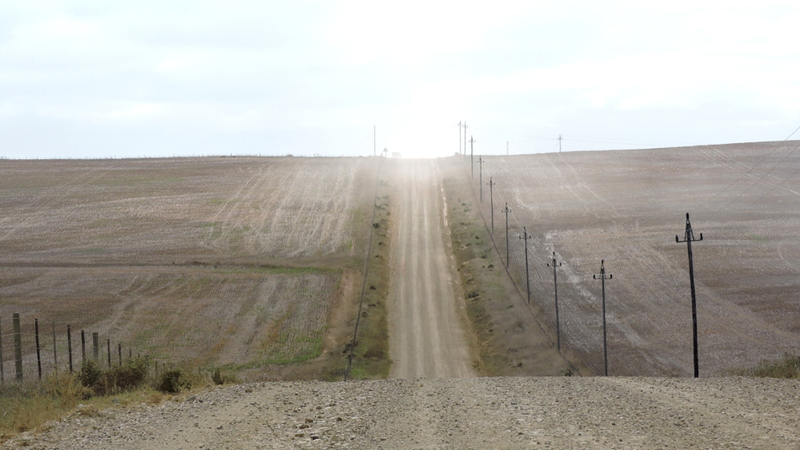 Too much traffic for a gravel road. Mainly locals. 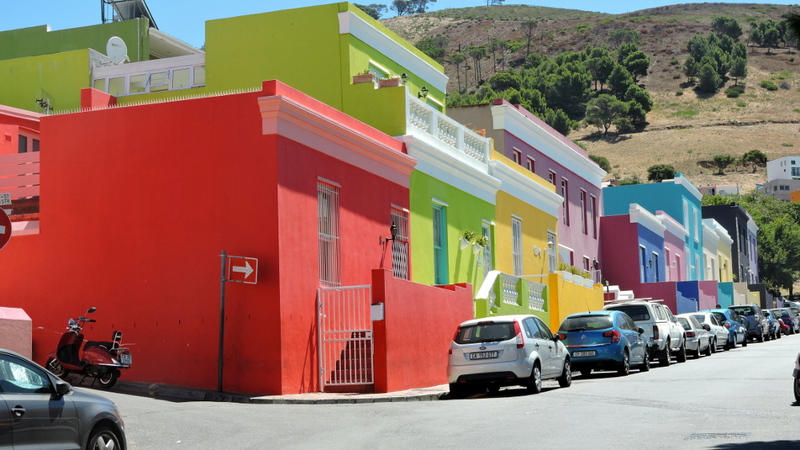 There were pretty, large farmhouses that belonged to white farmers. Most of them offered “Bed and Breakfast”. 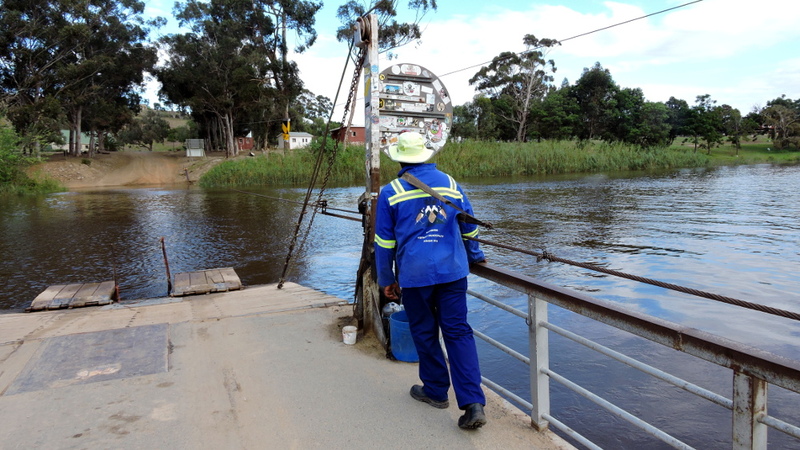 A strange ferry crossed the Bree River. 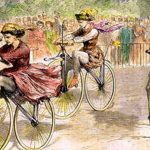 Two men were virtually the draft animals. They hitched the tightrope in the front, went to the back, and thus pulled the ferry to the front. When they reached the back, they returned to the front, and so forth. They did this year in, year out, for years. From morning until night, about 35 trips. A job for blacks. In South Africa there were even two. This one very lovely, with nice cafés and a lot of agriculture. The largest pumpkin was harvested here. 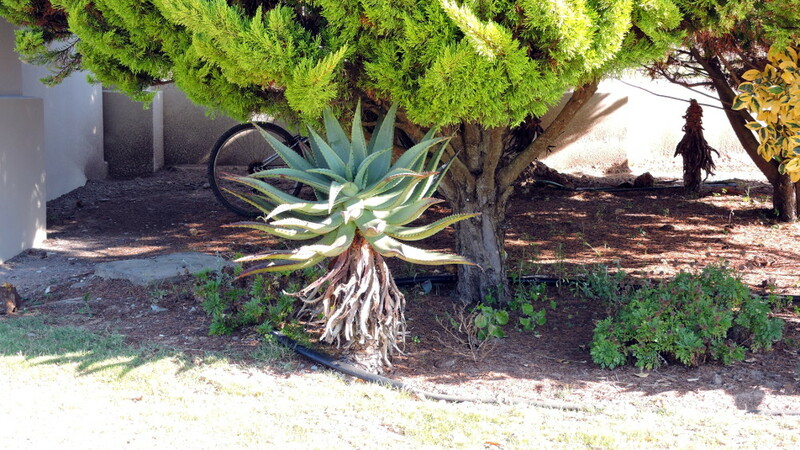 Further to the east was Albertinia, the capital of Aloe Vera. The soil here was particularly suited for these plants. There were two large factories whose products were exported globally. 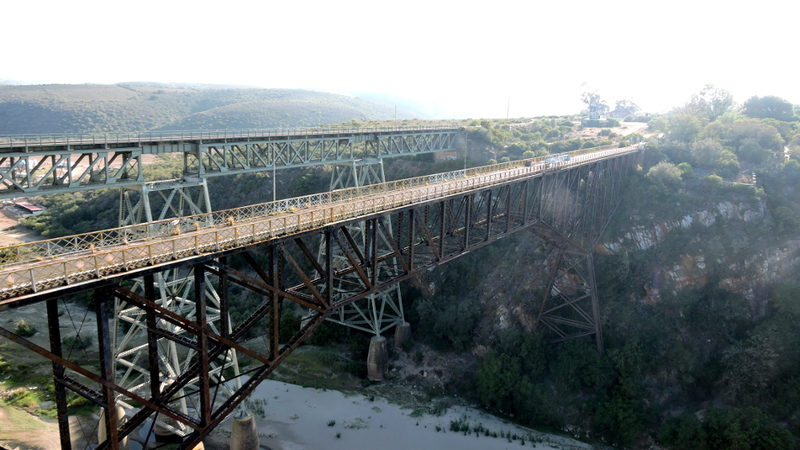 Before Mossel Bay was one of the erstwhile highest bridges. n the past it was a center for bungee jumping. The height should be sufficient but it could be more dramatic. 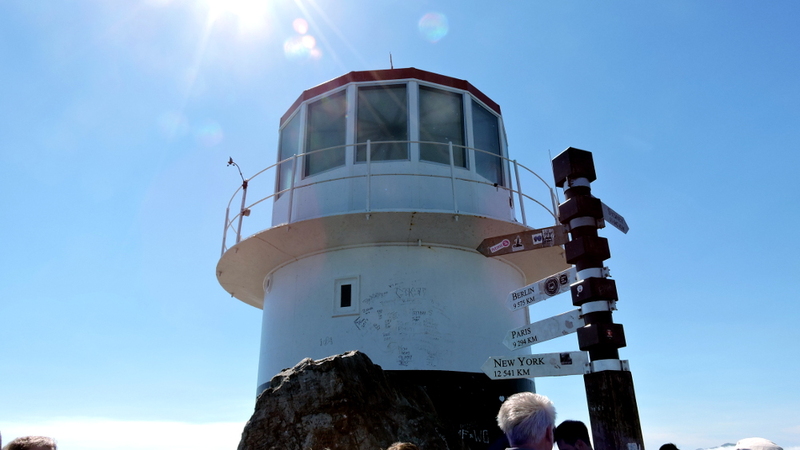 I’ll write about it in my next blog which covers the Garden Route that starts after Mossel Bay.